Did you know that the skin on your face is replaced every 2 weeks? Or that the cells that line your gut are replaced every 2 days!? That’s crazy! And what’s amazing is that you had nothing to do with it. Well, of course besides the fact that it’s your face and gut, but you didn’t actively do anything to cause it to happen. You can hinder or help the process – eat right, sleep well, that sort of thing but cause it? Nope. Not gonna happen. This is the kind of rest we need to find in Christ. We need to understand that when we rest in being His, amazing things can happen. We also need to understand that we can help or hinder the process. Let’s start with the hindering part first. 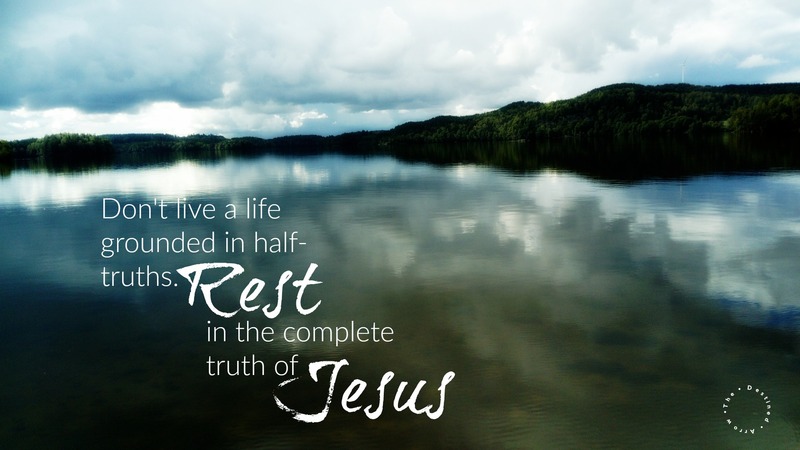 How do you hinder resting in Christ? You stress and worry about everything all the time. – Pretty self-explanatory here, are you a person who just can’t let anything go? Do you consider yourself stressed out? (Then you probably are.) Do you lose sleep at night over things you can’t control? The what ifs and might bes in life? If this resonates in your soul, you are hindering the power of rest. You feel guilty all the time. – Do you feel like you’re frustrating God? That He’s disappointed in you? That you haven’t spent enough time reading your bible or the latest best selling book on growing in Christ? Maybe the way you yelled at your kids earlier has God shaking His head at you? Guilty souls are void of the power of rest. You try, try, try. – Are you always trying to please God? Do good, be good and that way you’ll get good? Do you do things, not out of a love and desire to grow closer to God and grow as a follower of Christ but out of duty, obligation or trying to earn His blessing and favor? The mindset of ‘I’ll do my part, God will do His’ is a roadblock to the power of rest. All these things: stress, worry, guilt and striving are ways that we keep from tapping into the power of rest. I’ve been singing for Jesus for a long time, since I was 8 years old. I remember that every time before I would sing a solo I would panic. I would stand backstage or sit on the front row leading up to my solo and I would go over the song in my head repeatedly. Over and over I would sing the lines (this was before confidence monitors on the back wall, which have been a God-send to us singers!) and if I messed up in my head I would feel sick to my stomach. I would start over and try to get through it again, terrified of messing up. There was very little if any enjoyment in singing those days. I was so hard on myself, many times berating myself, convinced that my mistake was a disappointment to God and everyone else on the planet. Then one day something changed. I vividly remember standing backstage and waiting to walk out. But instead of my normal routine of reciting lyrics, I simply began to praise God. I remember gratitude welling up in my heart as I thanked Him for the privilege of singing to Him and for Him. I was filled with such peace like I’d never had before stepping on to a stage. I don’t remember what song I sang or even how it went. I remember that moment of connection with God. In those brief minutes before walking out on stage I, unconsciously, chose rest instead of worry and striving. I’ve never been the same since. Let’s take a look at the beliefs that may be fueling the hindrance to our rest. God isn’t really completely good. – I know, that sounds awful, but think about it, if you really believed that God is completely, thoroughly, 100% good then what do you have to worry or stress about? I get it, human nature is at play here, but we need to tell our nature to sit down and shut up. We can spout off verses like Jeremiah 29:11 in our sleep but when life is coming in hard it’s time to not just know it but rest in it. The Blood of Jesus covers everything…mostly. – When we walk around with our heads buried in a cloak of guilt and shame we are denying the efficaciousness off Christ’s blood. I get it, we mess up, we stay in bed longer than we should for 2 weeks straight, we fly off the handle and win bad mom of the year award for the 5th time this month. But none of those things is a sentence to a heavy heart and badge of shame. We mess up, we bring it to God, it’s under the blood – end of story. Move on. There is no award for feeling guilty. It doesn’t honor God, it doesn’t help our walk. It’s time we learn to rest in the finished work of the blood of Jesus and live like the redeemed children we are. Grace needs a little help. – Ah grace. Quite the hot topic, some people think grace is an excuse to live and let live and some people think grace apart from works is dead. Both are wrong. Grace is the mercy of God and the power of God. It doesn’t need any help from us. There is nothing we can do to earn God’s grace and mercy. And there’s nothing we can do to justify God’s grace and favor in our lives. In fact, it’s the grace of God that empowers us to do all the things that we try so hard to accomplish. It’s His grace that calls us to know Him, to move in Him and to rest in Him. When we choose to rest in the Word of God, the Blood of Jesus and the gift of grace we live an empowered life that produces contagious joy, unshakable peace and resilient hope. Question what you believe about God, don’t live a life grounded in half truths and always faith on.